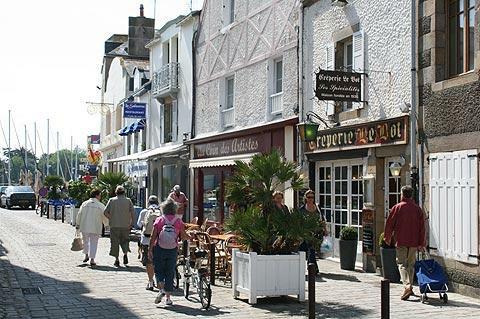 The harbour town of Le Croisic occupies a peninsula to the west of the Cote d'Amour, the coast in the Loire-Atlantique department (just south of Brittany), south of Guerande and west of Nantes. It is very attractive town and also very popular with visitors to the region. 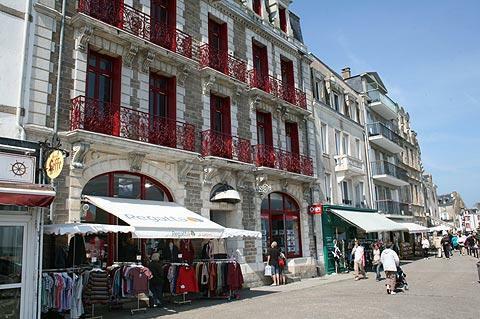 Le Croisic is officially listed as a 'small town of character'. On arrival, parking is available at both ends of the long harbour. 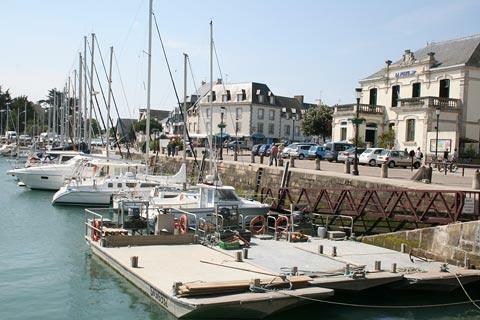 Your visit to Le Croisic will start will a promenade along the harbour, which includes a substantial pleasure port and also an active fishing port, and extends for quite some distance. 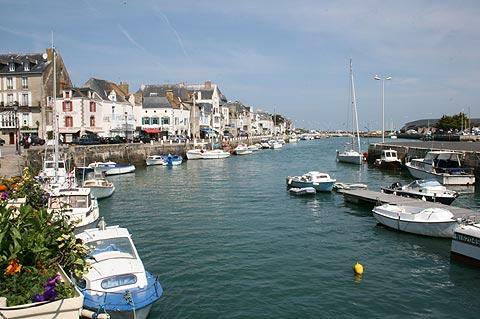 There are numerous cafes and restaurants along the harbour front, fish dishes a speciality! A good number of the houses along the seafont have interesting historical features to enjoy, some half-timbered and others with ornately decorative stonework. The statue you can see in the port is of Pierre Bouguer, an 18th century scientist born in Le Croisic in 1698 and well known for his studies of water courses. Although it is around the waterfront that your visit will be centred, while you are here don't forget to explore the town itself, just behind the centre of the seafront. 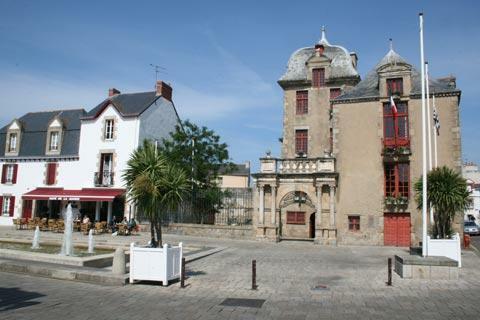 Le Croisic has quite an extensive historical centre, based around the church and the Place Donatien-Lepré, with its typical 16th century granite built houses, and with lots of houses having architectural highlights. Among the most interesting of the manor houses are the 15th century Manoir de Kervaudu and the 17th century Hotel d'Aiguillon. As you walk around the centre of Le Croisic you will also notice recreations of paintings of the town by reputed artists which add additional interest: there are 25 of these in total, and if you want to make sure you see all of them you can ask for a leaflet in the Tourist Office. Among the religious monuments of interest in Le Croisic the most interesting is the 16th century Church of Notre-Dame-de-Pitié that dominates the town centre, built out of granite in the gothic style: the tower (16th century) and stained glass windows (19th century)are among the points of interest, as are the Chapel of Saint-Goustan and the Chapel of the Crucifix. In the garden of the Hotel de Ville there is a large bronze cannon that was made in the 17th century, and still has its original carvings and markings. This rare cannon was discovered in the sea off Le Croisic by a fisherman in 1955: quite a catch! Although there is not a beach in the town centre, there are also several quality sandy beaches in and around the Le Croisic peninsula, the Plage de Port Lin and the Baie de sable Menu are especially popular with families, while others include Saint-Goustan beach, and the beaches in the bays of Castouillet and Crucifix. The most popular activity is the Océarium on the northern side of the peninsula, a large aquarium complex where you can see all manner of sealife from seahorses and crabs to sharks and sting rays. Part of the visit is through a large glass tunnel that passes under water. The jellyfish were our favourites, the penguins were the most popular with the children! After enjoying Le Croisic itself follow the road along the Cote Sauvage around the peninsula to the west towards Batz-sur-Mer, allowing time en route for a clifftop walk to admire some of the finest coastal scenery in France.